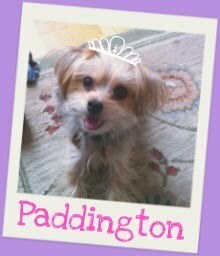 Barkzilla: A Savvy NYC Dog Blog: Paws up for Pawgua! As the weather has started to get cooler, it's time for us to wrap up our Summer Hydration Series. 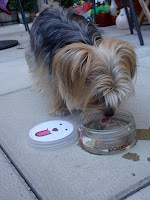 Though we were skeptical when we started this series about the value of bottled water for dogs, this summer we totally changed our minds-- especially when it comes to portable water options that come in bowl shaped containers, like Pawgua, which make it easy to satisfy our furry friend's thirst. Even though the nip of fall is totally in the air, it was still warm enough for us to work up a sweat on our AM walk, which meant it was time to crack open some Pawgua! Designed for thirsty dogs on-the-go, it gets props immediately for its "bowl" shaped container, which meant that Paddy wasn't freaked out to drinnk from it. The BPA free, recyclable container is filled with about 8 oz of "premium purified water," which makes it small enough to be easily portable, but large enough to satisfy your dog's thirst. Pawgua's packaging was a little less leak prone upon resealing; we had minor "spill" issues when trying to take a previously opened APB with us to the dog park. APB has a protective seal under the cap of its package, whereas Pawgua does not, hence the minor spillage you can see in our photo. APB seems a little more "high-tech," with its mineral breakdowns and enriched water options. However, while we thought it was cool-- at the end of the day, as long as Paddy's thirst is quenched, that's what that really matters to us. While Pawgua is still in the process of finalizing its distribution, you can find out more by visiting their website or Facebook page (www.facebook.com/pawgua). Each "bottle" retails for $2.75. We hope that you've found our summer hydration series interesting and helpful, and look forward to resuming it next summer! We'd love to hear if you've tried out any of the products we've covered, or what you used this summer to keep your dog cool!